It's that time of year when we take a deep breath, put the past year behind us and look forward to a new start. Resolutions and promises to ourselves flow into our minds and onto the pages of our journals. Many are started that do not last. For me it is nearly always includes less food and more exercise. This year I took the pressure off and started the gym in December but still the diet will start tomorrow. Inspired by the book Bread and Wine by Shauna Niequist I am going to go back to the basics of cooking and try and get away from easy convenience food. I do not enjoy cooking and a long list of ingredients has me grabbing for a jar of something. Shauna makes it sound simple and enjoyable. Well that's my plan, but I got to thinking, if God made my resolutions what would they be? I'm not sure he cares much about my weight, so long as I'm healthy. I'm not sure he cares much what I cook, so long as we're fed and we engage over a table with others. He would no doubt be more concerned about spiritual exercise than physical. So, I prayed and I asked him, and as I read his word he opened up this verse. "Enlarge the place of your tent, stretch your tent curtains wide, do not hold back;"
God made us to be in community and to connect with others. Making disciples wherever we are; lead, teach, encourage and befriend. You do not need to be a mentor or teacher to disciple. You do not need to be a leader to inspire. You only need to be a friend and to open your tent curtains (or door) wide and let others in. 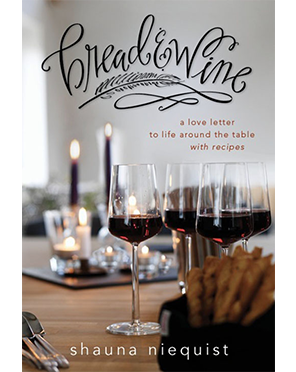 This book, Bread and Wine, is not about cooking. It is about gathering people around the table, laughing, crying, telling stories and sharing lives. You may not be a natural entertainer, I'm not - I worry too much about what I'm serving and how clean my house is. Keep it simple, don't hold back in opening your home and your life to others. Jesus sat many times around a table sharing a simple meal and as we follow him we should seek to do the same. I don't want to get hung up on how my home looks or what I'll serve, I want to gather people round a table and share a simple meal. How is God challenging you to enlarge your tent and open your life? How can you open your tent curtains wide? Where do you need to let go and not hold back? Seek God - Let's make our resolutions this year one's that he would choose for us, for our good and for His glory. I would love to hear how you feel challenged to open your life for God. Leave your comments below. Connect with me on Facebook and share your favourite recipes but keep it simple!